Look, we are all used to referring to tablets as mobile devices. After all they almost pocketable, easy to carry around and the good ones have a long battery life, much longer than notebooks. That’s why it might have come as a bit of a shock when Facebook founder Mark Zuckerberg boldly and confidently said they are not. "iPad's not mobile, next question,” Zuckerberg said in 2010. "It's not mobile, it's a computer, it's a different thing." You may or may not agree, but here is an interesting little chart that gives some solid backing to the theory that while it might be mobile, the tablet is rarely used as a mobile device. A comScore/Business Insider study found that 90% of the time people use their tablets at home. Less than 40% use it in public and less than 30% at work. Not very mobile, is it? A few facts in my opinion: 1. 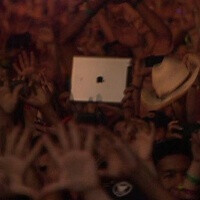 It is about iPad and of course iPad is too big to be a handy device to carry around for its large screen. 2. Any device with 8+ screen can fall into above category 3. iPad is not a computer either 4. Not all tablets are iPad 5. 7 inch tablets are much better to carry around, not pocketable but much easier to carry 6. Tablets are occassionally to use outside of course due to the size. They are mostly couch-or-sit-and-relax type of devices. 7. Mobiles will always be more use outside simply because of their "communication" range- you know things that can call, or text, or could go online without wifi. Agree with you, for some people it is very easy to take large devices in pockets and some can just keep it in hands. It would be really great if everyone would put the words "the" and "an" in front of Apple products. Examples from above: 1. It is about *the* iPad and of course *the* iPad is too big to be a handy device to carry around for its large screen. 3. *An* iPad is not a computer either 4. Not all tablets are iPad*s*.......or.......Not all tablets are *an* iPad The iPad, iPhone, and iPod are not entities--they are single products. Talk about annoyance -.- P.S. -- Tablets are computers. Here's another for ya: A programmable machine that performs high-speed processing of numbers, as well as of text, graphics, symbols, and sound. All computers contain a central processing unit that interprets and executes instructions; input devices, such as a keyboard and a mouse, through which data and commands enter the computer; memory that enables the computer to store programs and data; and output devices, such as printers and display screens, that show the results after the computer has processed data. I appreciate the corrections, honestly. English is not my first language and I am not very good at it specially when I am in a fast flow but I always welcome any correction and learn from it. Just like I read your statement several times to memorize my mistakes. Many thanks for this. About what I said that tablets are not computers, it is simply because tablets are more of a larger smartphones. Unless of course companies will start putting full OSes into them, full Windows, full Mac’s OS and so on. Besides that, in basic term of “Computer” even a smartphone is a computer too, this is how I explain any one who ask what is a smartphone. I say it is like a little computer. Just because you use something more in the house doesn't make it non-mobile, I use my cell phone more in my house, is it still mobile? Just because a tablet is used more at home than in the car or office doesn't mean that they use it at a desk like a desktop. I know quite a few people who sit and watch sports or something else and use their iPad at the same time to check Facebook or shop online. You know what would make em more mobile. Getting rid of data caps and/or ridiculously high data plans so we can use them as they are intended. Mark Zuckerberg Mark Duckerberg Mark Dumberberg Marked! I forgot to add something. A tablet is of course mobile, although it stays mostly at home but it is not staying on single place. User can grab it and go out on the porch, go out sitting next door, get in taking it to bathtub! If a Laptop is a mobile, so can be Tablet. It is just not too much of an outdoor device. Exactly. My desktop PC is stationary. I cant take it in my bathroom or bedroom. I can take my phone or a tablet if I had one. This is crazy....not mobile....lol. This is one pointless article. I use my PS Vita and phone at home more than in the streets or about 50/50. But the Vita exclusively at home now. Those are not mobile devices now? Agree with the post above me....pointless. Before we get all flustered and forthrightly disagree with the article, perhaps we should make an effort to "understand" the context of the term "mobility" as implied here. Mobility varies, a desktop that's considered NOT MOBILE can be moved from one place to another e.g. from one room to another room & with a powerful UPS you can work for hours disconnected from mains or even travel in a vehicle/truck while working on a desktop! So the possibilities are there. I think the point made in this article is that most people do not find taking a tab out of the home or office (considered safe spaces) very convenient which defeats the purpose when they (tabs) are supposed to be MOBILE. I'll be honest I was one of those doubters who thought the iPad was a passing fad when Jobs introduced it but seeing the friendlier size of 7" & 8" I'm now a believer though.